What traveled at 11 mph for 5 hours in order to cover the distance of 9 miles? The Johnson County All Electric House! Originally built in the 1950s, the All Electric House was carefully (and slowly!) moved in May to its new home inside the county’s Arts & Heritage Center. The All Electric House is being refurbished and will reopen to the public in 2017. When it does, it will feature Bellaforté Shake shingles on top in an Autumn-VariBlend color. Since opening in 1998, more than 55,000 people have toured the House. 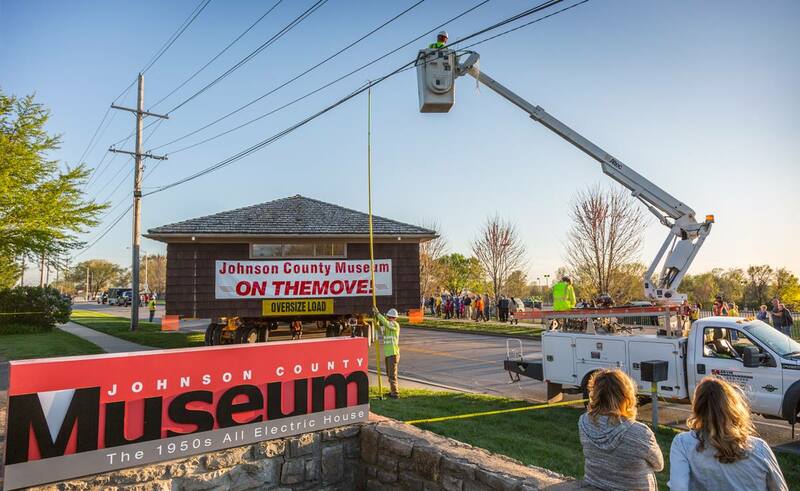 At the new location, the All-Electric House will be protected from the elements since it will be featured inside the massive Arts & Heritage Center as a cornerstone of the new signature exhibition, Becoming Johnson County. Stay tuned for more news on the “Museum on the Move” — including the installation of the composite shakes. The move itself (which involved 50 officers from six jurisdictions!) – stay tuned for updates! Or, learn more about roofing systems for other museums at Museum Rooftops.